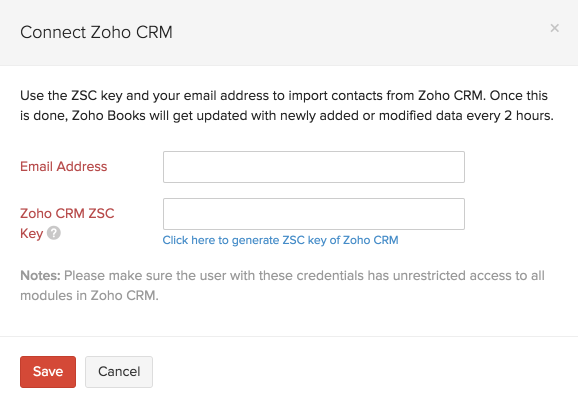 If you have a Zoho CRM account, you can now connect it to Zoho Books and sync your Zoho CRM data with Zoho Books easily. 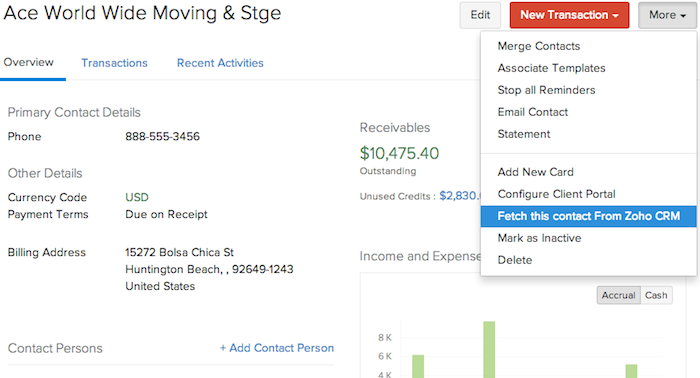 This means you can track and manage key CRM as well as accounting information in the same place. Login to your Zoho Books account. Click on Settings and then select Integrations. Click on the Connect button under the Zoho CRM section here. When you click the button to connect to Zoho CRM, you will be asked to enter your email address as well as the ZSC or Zoho Service Communication key generated from your Zoho CRM account. This will initiate the Zoho Books - Zoho CRM integration. For every record pushed from Zoho Books to Zoho CRM, the record owner will be the person associated with the email address entered here. Therefore, take care to ensure that this person has access to all the modules in Zoho CRM. A ZSC key is unique to a particular Zoho product, and can be used to access your data in that product from other Zoho products. To generate the ZSC key, just click on the link which reads ‘Click here to generate the ZSC key of Zoho CRM’. This will take you straight to the Zoho CRM screen from where you can obtain this key. Just copy this key, and paste it in the integration screen in Zoho Books before clicking on Save. Note: If you’re connecting to a Zoho CRM account where you’re a user and not the admin, you can follow the same process as above after obtaining the desired email address and ZSC key from the admin of the Zoho CRM account. Your organization name, email address and your region(country). The details of all your contacts in Zoho Books. Once you’ve set up your credentials, you can go ahead and start syncing your contacts in Zoho Books to your accounts/contacts in Zoho CRM. This is a five-step process. Accounts - Only the Accounts in Zoho CRM will be available for integration. They will be synced to Contacts in Zoho Books. 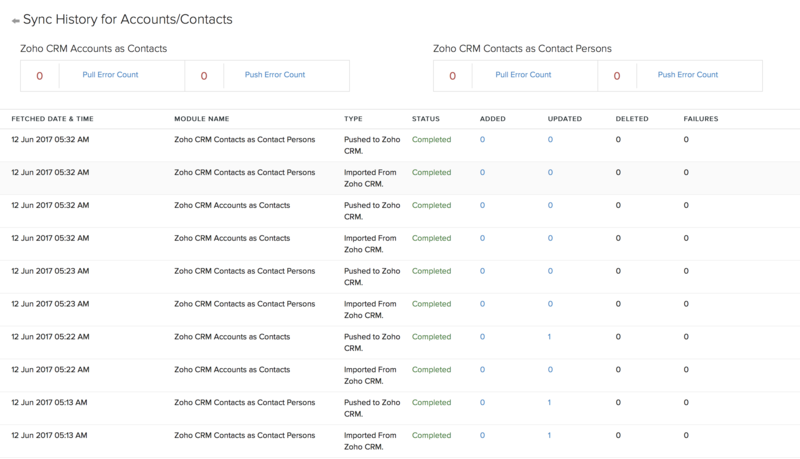 Contacts - Only the Contacts in Zoho CRM will be available for integration. They will be synced to Contacts in Zoho Books. Accounts and their Contacts - Both the Accounts and the contacts associated with these accounts from Zoho CRM will be available for integration. The Accounts in Zoho CRM will be synced to Contacts in Zoho Books, while the Contacts from Zoho CRM will be synced to Contact persons in Zoho Books. The contacts under a particular account in Zoho CRM falls as a contact person under the respective contact in Zoho Books. Note: When ‘Accounts and their Contacts’ option is selected, only the contacts associated with the account selected in Zoho CRM will be chosen for integration. 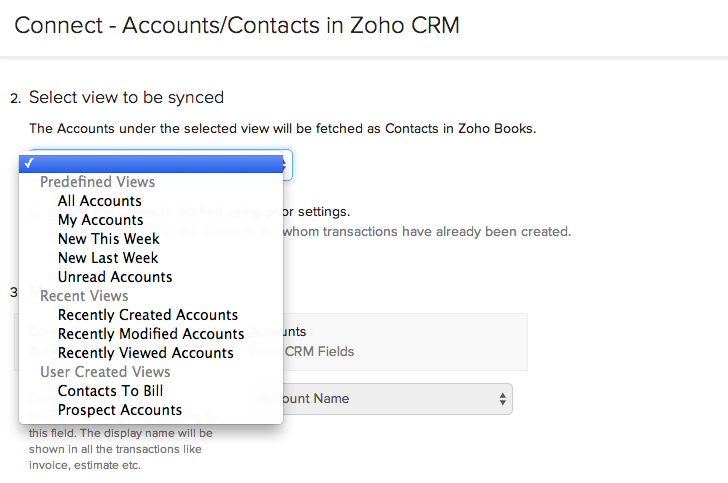 Contacts in Zoho CRM which are not associated with any account are not synced with Zoho Books in this scenario. Fetch from CRM - Zoho CRM accounts/contacts will be imported as Zoho Books contacts/contact persons. However, no Zoho Books data will be exported to Zoho CRM. Sync both ways - Zoho CRM accounts/contacts will be imported to Zoho Books and vice versa. Clone - The record is cloned and both the original and duplicate records exist. Overwrite - The duplicate record overwrites the existing record. Skip - The duplicate record is not synced and the existing record is retained. The next level of customization is where you can select the View you want to sync with Zoho Books. A view in Zoho CRM is a collection of similar records (based on a specified criteria) listed together. Some predefined views include ‘All Accounts’, ‘My Accounts’, ‘Unread Contacts’ etc. Go to your Zoho CRM account. Click the Setup icon on the top-right corner of the window. Select Contacts/Accounts from the module list. Drag and drop a Checkbox field onto the Contact/Account Information section of the layout. Fill up the lable name as Zoho Books and hit Save Layout. Now, when you edit an existing account/contact or create a new one, a checkbox Zoho Books will be displayed. Now, edit the accounts/contacts which you want to move to Zoho Books, and check the box Zoho Books in each one as shown below. Once this is done, create a new view under Accounts or Contacts depending on which of these modules you’ve selected for import in Step 1. Specify criteria field for the view as Zoho Books from the drop down and set it to true. This is shown below. Now, all the accounts/contacts for which this field was checked, will be available under this view. During the integration, as soon as you select the module (Accounts, Contacts or Both) to be synced, a list of the corresponding views available in Zoho CRM for the module (predefined as well as User created) will be listed under the drop-down. Select the view you created above to proceed with the import. Note: When the option ‘Accounts and their Contacts’ is selected, you have the option to select the Account view as well as the Contact view required to be synced. You can manually choose to sync only specific contacts associated with the account view selected, as shown below. The final step of the integration is the mapping of fields. 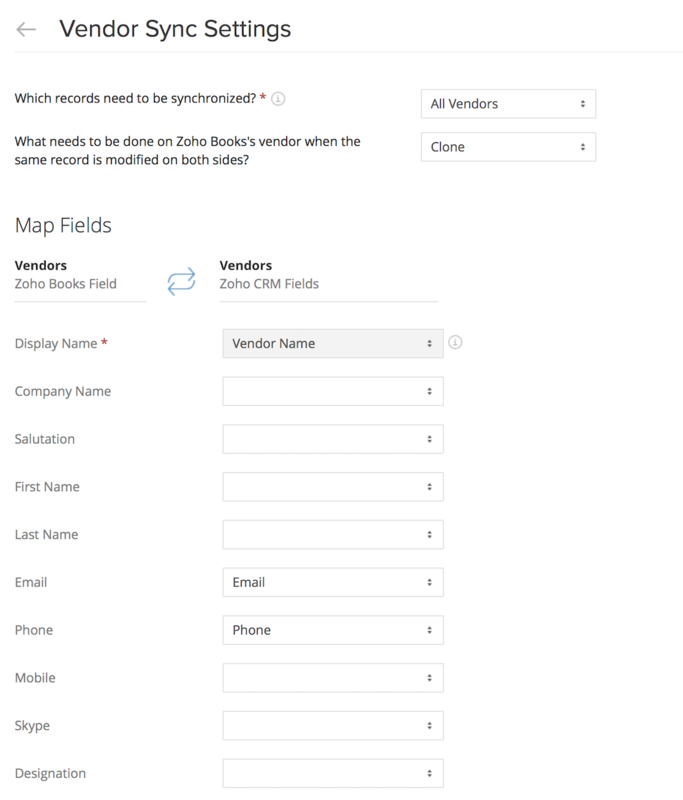 You can map the Zoho CRM field to the corresponding Zoho Books field before setting up the sync. This manual mapping ensures that when the Zoho CRM records are synced as Zoho Books entities, all the fields match perfectly when viewed in Zoho Books. Note: You can create up to ten custom fields for your contacts in Zoho Books. In case you’ve enabled multicurrency in Zoho CRM, please make sure that the base currency is same as that in Zoho Books before mapping fields. When you create an invoice for a contact imported from Zoho CRM, you can view account information and list of potentials for that particular contact as shown below. If you’ve completed the integration, the contacts you imported will be displayed in Zoho Books. However, you can also create a transaction for a contact that you did not import from Zoho CRM. While selecting a customer for a new transaction, an option ‘Search in Zoho CRM’ is listed. Any Zoho CRM contact may be selected from here. Now, this contact is automatically fetched to Zoho Books and can be viewed and updated from here. If you chose to import Accounts and their contacts or Accounts only during integration, you can search for a contact using the account name in Zoho CRM. All contacts under the account name you type will be listed. 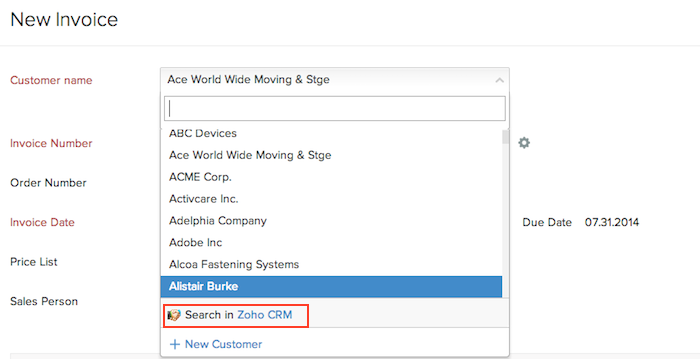 If you chose to import Contacts only, you can search for Zoho CRM contacts using their first and last name. There are two sets of estimates/invoices/sales orders that exist for your accounts/contacts in Zoho CRM. 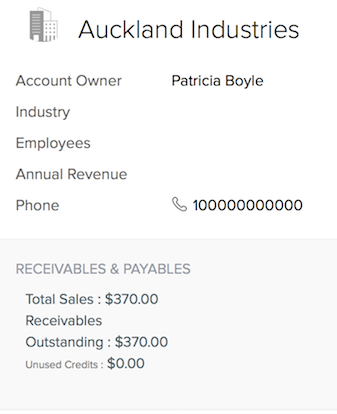 One set consist of the quotes/sales orders/invoices you create for your Zoho CRM contacts. These are not a part of the data integrated with Zoho Books. You can also create estimates/sales orders/invoices for your Zoho Books clients from within your Zoho CRM account. These will be transferred to and displayed in your Zoho Books account. Log in to your Zoho CRM account that has been integrated with Zoho Books. Under Accounts or Contacts, select the record you want to create a transaction for. Scroll down to the section Zoho Books. Here, you can view a list of estimates, sales orders and invoices available in Zoho Books for this record. Click on New estimate. Fill in the required details and save it. You can follow the same method to create new sales orders and invoices. Transactions created here will be a part of the Zoho Books integration, and can be viewed, edited and sent to customers from your Zoho Books account. Once you’ve set up your credentials, you can go ahead and start syncing your vendors in Zoho Books to your vendors in Zoho CRM. This is a four-step process. Fetch from CRM - Zoho CRM vendors will be imported as Zoho Books vendors. However, no Zoho Books data will be exported to Zoho CRM. Sync both ways - Zoho CRM vendors will be imported to Zoho Books and vice versa. Note: If there are duplicates in either your Zoho CRM or Zoho Books account, and the overwrite option is selected, the duplicates will be merged as a single record after sync. The next level of customization is where you can select the View you want to sync with Zoho Books. A view in Zoho CRM is a collection of similar records (based on a specified criteria) listed together. Some predefined views include ‘All Vendors’, ‘My Vendors’, ‘Unread Vendors’ etc. Click here to know more about creating a view in Zoho CRM. 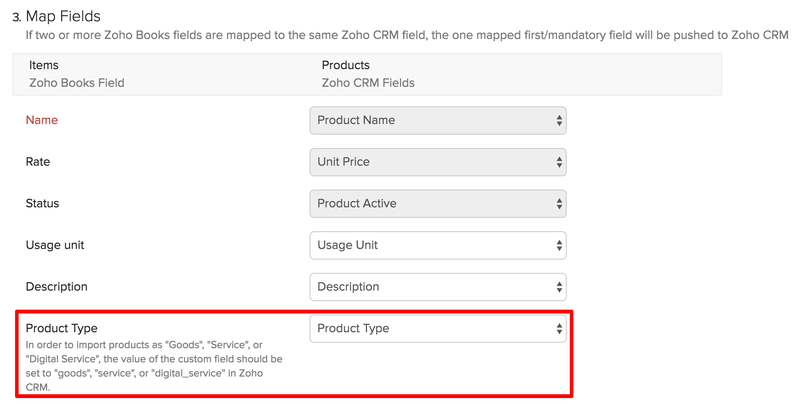 In case you have created custom fields for your vendors in Zoho CRM that don’t map to any of the default fields under Zoho Books, please remember to create the corresponding custom fields in Zoho Books before starting the sync. These fields will now be displayed for field mapping. See how to create custom fields for your vendors in Zoho Books here. Note: You can create up to ten custom fields for your vendors in Zoho Books. The Zoho CRM - Zoho Books integration also supports two way product sync i.e Zoho Books items exported as Zoho CRM products and vice versa. Fetch from CRM - Zoho CRM products will be imported as Zoho Books items. However, no Zoho Books data will be exported to Zoho CRM. 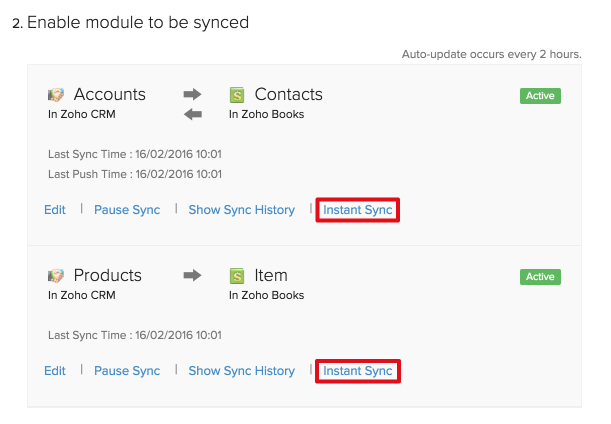 Sync both ways - Zoho Books items will be exported as Zoho CRM products and vice versa. It’s possible that an item in your Zoho Books account has the same name as a product in your Zoho CRM account. In such cases, this particular record is said to be duplicated during the sync. You can choose what you want to do with such records. As mentioned above, Zoho Books items will be pushed to Zoho CRM first and hence, duplicate records fall in Zoho CRM if the sync is both ways, and in Zoho Books if it is one way. Important: To update the Product Type field in Zoho Books, please create a custom field in Zoho CRM of name Product Type. 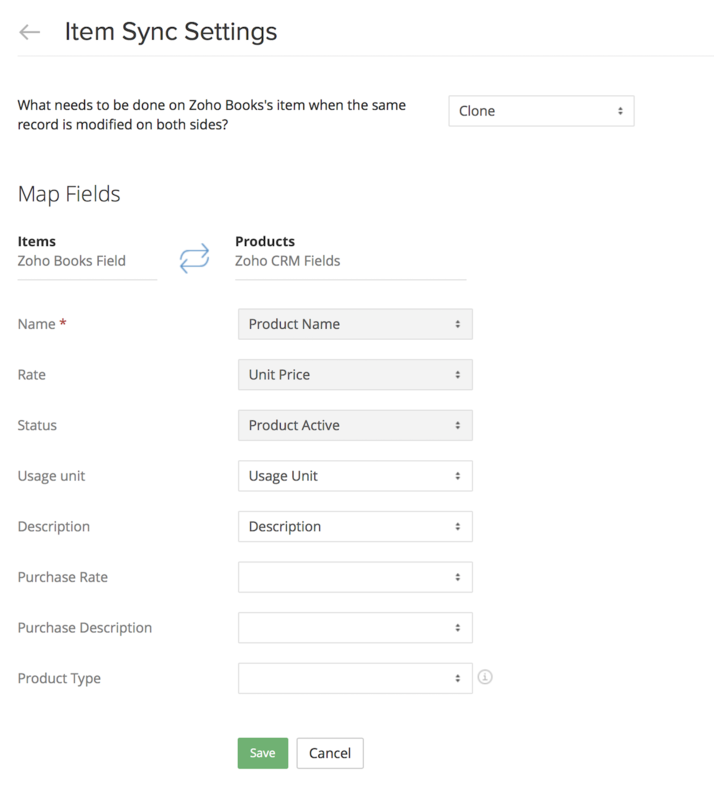 While mapping the fields, choose this field to be mapped to Product Type in Zoho Books. Note: In order to import products as “Goods”, “Service”, or “Digital Service”, the value of the Product Type custom field should be set to “goods”, “service”, or “digital_service” respectively, in Zoho CRM. Another handy feature of this integration is the configuration of triggers. For example, you can opt to have an estimate created automatically in Zoho Books every time you create a potential in Zoho CRM and much more by setting up these triggers. To do this, scroll down past the contact and item configuration sections. Here, you can find the following options under Trigger for other entities. Select what you want to automate in Zoho Books when a potential is won or lost in Zoho CRM. Create/Approve/Decline Estimate when a Potential is created/won/lost respectively. 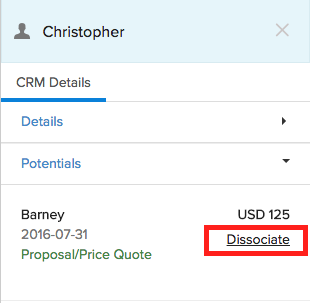 Create/Void Invoice when a Potential is won/lost respectively. Note: If Accounts and their contacts or only Accounts are selected for sync, the potential in Zoho CRM should be associated with an account for the trigger to be automated. Similarly, if only Contacts are selected, the potential should be associated with a contact. A potential being won or lost in Zoho CRM depends on the custom field Probability under each potential, and will not work if this field is removed. 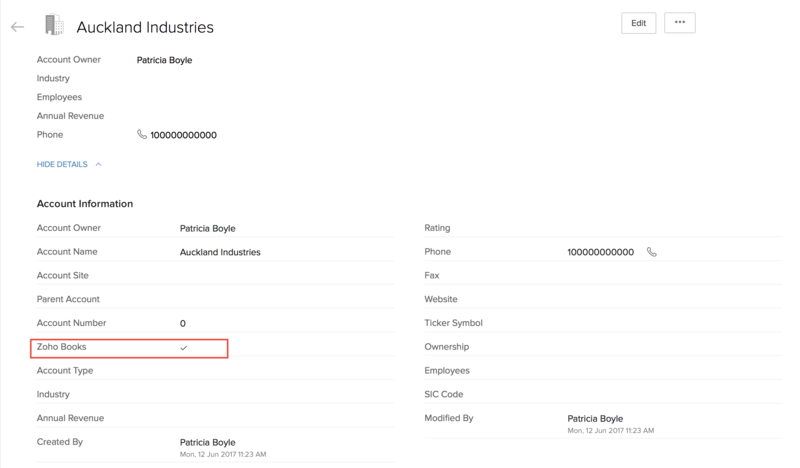 For example, lets assume trigger to create invoices automatically is set up. 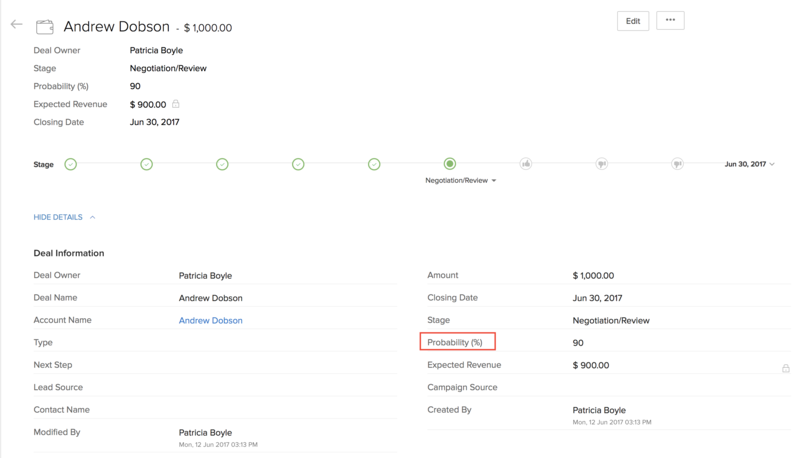 Now if the stage of a potential is marked as closed won in Zoho CRM, probability changes to hundred and an invoice is created in Zoho Books. If the potential is then edited to change the stage to closed lost, the invoice is voided in Zoho Books. Once the invoice has been marked as Sent in Zoho Books, changes made to the potential will no longer affect the invoice. Note: Entity triggers will not work in U.S edition organisations. 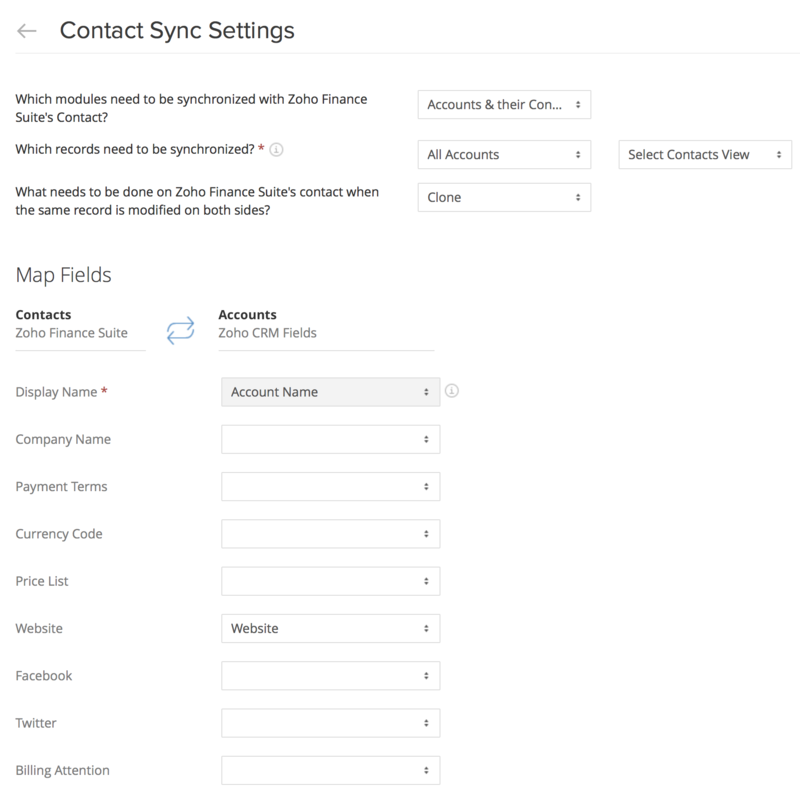 Auto and instant Sync : Once you’ve configured the integration, any new data you add will be updated via the auto sync that occurs periodically after the initial sync. However, there’s also a manual instant sync option, as shown below, which you can use to sync updated data anytime. If you wish to update changes made in Zoho CRM to a single contact rather than run a complete sync, select that particular contact and click on ‘Fetch this contact from Zoho CRM’ as shown below. Edit settings : The Edit option lets you modify the conditions set for the sync anytime. These settings will be stored for the next automatic or manual sync carried out. Pause/Resume sync : This option allows you to pause the auto sync, as well as disable the option to carry out instant sync. Any manual sync that is taking place when the ‘Pause’ option is clicked, will be completed before the pause is effected. You can always select ‘Resume sync’ to enable auto and manual sync once more. Show sync history : You can view your sync history anytime by clicking on the link available below. This shows you a detailed history of the sync including the number of records added, deleted and updated along with the time and date they were fetched into Zoho Books. Sync failures are shown and the reason for that can also be viewed. Zoho CRM users are associated with a certain profile, such as Sales or Marketing during creation. The admin can modify each profile in order to grant and remove certain privileges. Once a profile is permitted or denied a privilege, this condition is applied to every user under that profile. Log in to your Zoho CRM account using admin credentials. Click on Setup - Users and permissions - Profiles. Click on Edit for the profile you want to allow/deny certain actions. Scroll down to Zoho Books Permissions. Here, next to each transaction such as Estimate, Sales order and Invoice is a box that you can check or uncheck in order to allow or deny the following actions respectively. Create and Edit - Creating and editing the transactions. View - Viewing the transactions. Email - Sending out the transactions to customers. The users under this profile can create and view transactions but cannot email them to contacts in Zoho Books. Viewing Receivables and Payables summary of your accounts/contacts can similarly be restricted i.e Checking/Unchecking the box next to it will allow/deny the users under that profile from viewing the financial summary of their Zoho CRM accounts and contacts, the data for which is fetched from Zoho Books. It is a well known fact that for a business to grow, opportunities or potentials must be converted to customers. Potentials are won or lost depending upon the offers you make them. You can now link potentials from your Zoho CRM account, to estimates, sales orders, and invoices in your Zoho Books account, and make sure you win them over. Make sure that you have set up the integration between your Zoho Books and Zoho CRM accounts. Ensure that you have enabled custom modules in your Zoho CRM account. Note: You can link a potential to multiple estimates, sales orders and invoices. Once you select the option, you will be prompted with a screen as shown below, wherein you have to select the Potential. This will associate the potential to that particular estimate or sales order or invoice. Now go on and win all the Potentials! Note: Potentials previously linked using triggers cannot be dissociated.